While T-Mobile is still the nation's third largest carrier, it is the fastest growing wireless operator in the country. When you consider where the carrier was a few short years ago, you can really appreciate what the company has accomplished. When we think back seven to eight years ago, T-Mobile was stuck behind Sprint, last among the top four major stateside carriers. It was last to start building out a 3G network and well behind Verizon and AT&T with 4G LTE. T-Mobile didn't have an identity outside of its television pitchwoman Carly. When John Legere became CEO in 2012, he immediately tried something that his counterparts at the three other major U.S. carriers had never tried before; he put the customers first. He got rid of subsidized phones, two-year contracts and gave subscribers many perks (most recently, free Netflix). Legere soon became the Pied Piper of wireless as T-Mobile morphed into the most innovative of the major stateside carriers. When T-Mobile started Data Stash, allowing customers to rollover unused data from one billing cycle for 12 months, AT&T was quick to copy with its inferior Rollover Data. Those not familiar with the executive would never guess that he is running a multi-billion dollar company. 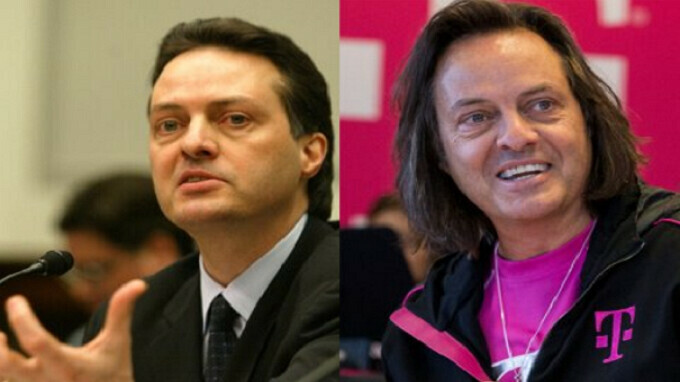 With his rock-star length hair, ever-present magenta T-Mobile t-shirt, Legere does not look like a CEO. And after hearing him call Verizon and AT&T "Dumb and Dumber," and toss away well-placed expletives during conversations, most would wonder how he got the job. But Legere is money in the bank; fixing customer "pain points" has become quite lucrative for the company. Some quarters, T-Mobile is responsible for the vast majority of industry profits in the U.S. Last year, 5.7 million net new customers signed on to T-Mobile. Thanks to Legere's focus on the consumer, T-Mobile was just awarded the highest ever score for wireless customer care from J.D. Power. This was for the 2018 U.S. Wireless Customer Care Performance Study, Volume 1, for full-service firms. The carrier's pre-paid MetroPCS unit also set a new record for the survey conducted for non-contract carriers. For T-Mobile, this was the 15th time since 2004 that it finished first in this particular category, and for MetroPCS it was its fifth time on top dating back to 2013. The J.D. Power survey measures the entire customer care process from initial complaint to problem resolution. Both T-Mobile and MetroPCS finished with the exact same "overall satisfaction" score of 828, the highest in the eight years that the marketing information firm has measured customer care. Another analytical firm, HarrisX, had T-Mobile ranked number one throughout 2017 in Overall Customer Satisfaction, and likelihood to recommend. As for Legere, he has made T-Mobile extremely popular among kids, teens and young professionals. His constant social media exposure has turned him into a walking, talking 24 hours a day billboard for the brand. That's good news. Hopefully Sprint learns from this and ups the ante. In before... T-Mobile doesn’t work in my area ! Now this is definitely plausible. I always wondered if companies paid JD for favorable ratings. They do. JD Power's reports cost several throusand dollars; provide insight on how to fix issues facing customers. T-Mobile gained insight to how customers without service are allowed to cancel just by asking. This allows T-Mobile to fund and finance devices that are able to work on networks with better coverage like AT&T or Verizon. Getting a free phone, and no cancellation fees often makes T-Mobile customers relative happy in general. T-Mobile only charges early contract cancellation fees if customers are snooty on the phone. If you're going to make a claim like that, show some proof or just drop it. I mean, c'mon. Are we just supposed to take your word on that? Can you cite a source for your claim about J.D. Power getting paid for ratings? Just curious, as I'm not new to the internet and performed a search after reading your comment, only to find nothing backing your claim. So while I'd like to believe you weren't trolling, no evident support of your claim was found. If you call JD Power and ask them for a copy of the report, they'll give you the price of the report. The correct report, includes 100-200 slide deck which details out how customers responded in certain ways. Also, those that pay JDPower are given the option to submit a list of potential customers JDPower should call. When companies like T-Mobile can submit customers, T-Mobile can limit the people who are un-happy. Many factors can stack the deck in T-Mobile's favor; but they technically call this "customer segmentation". For example, T-Mobile customers whom pay early, or on-time will be more satisfied than a late-payer. Also, auto-pay customers statistically score 5% higher than those who write a check. Additionally, T-mobile can filter out those whom called to complain about coverage. Maybe they live under a cell tower or have grudgingly decided to live with the poor coverage for one reason or another and stopped calling out of despair. (difficult to determine; often requires a customer service manager to review the phone call records.) Customers that received bill credits for being a referred customer may artificially increase customer satisfaction scores. Also, customers that use the T-Mobile's Freeloader Friday app may appreciate the free things like oil changes and gas cards. Finally, if T-Mobile submits customers that took advantage of T-Mobile's highest-subsidized promotional plans such as a buy-one-get-one-free on a $800 smartphone will probably be happier than someone who didn't get a second iPhone for free. This sounds like you literally made it all up. Tmobile customer care and coverage were complete trash for me. I guess others must have a good experience. I have to say everything good about T-Mobile. I've had AT&T service, Verizon, Sprint, Boost, Consumer cellular in the past. Verizon has the best coverage, but to Hell with their prices. T-Mobile works great for me in my area. At $60/mo for unlimited everything, works great. AT&T wants to gouge you for every bite, and let's not even mention Sprint. Good for T-Mobile. So this is my experience. Cell phone service is now on par with VZW in my opinion. As far as customer service I ran into issues every time I tried to return a phone back to their warehouse from ordering at tmobile.com. First was a Samsung smartwatch. After mailing it back, tracking said delivered but their warehouse lost it and never processed the return. I talked to like 20 reps throughout 6 months and finally got the money back after I had to email John Ledger himself. 2nd was again mailing back my iPhone x. They took off the eip, but didn't refund my $362 deposit. After countless calls, again I had to get an exec involved. Once I did that, they only refunded $262, then I had to call back for the other $100. So bottom line, as long as you don't put yourselves in a situation to have to call, then you should be ok since u don't have to call and talk to them lol. Every time I call T-Mobile 95% of the time I get someone that barely speaks English, then just apologizes 50 times for 30 min and really gets nothing done. I have never had anyone fix my problem on the first call. Your better off not calling. Even now, I called 2 times to have my phones unlocked since ive had my phones for over 45 days now and they're still not unlocked. The rep would say he or she will process it, but NADA happens. So just find your low plan, buy your phones on Amazon, or buy them from tmobile just make sure ur sure so u don't have to return them, and you should never have to call customer service. That's what I plan on doing. I do not agree when you said cell phone service was on par with Verizon. Uhm..that's a no lol. I do agree that Tmobile customer service is sketchy. 9 times out of 10 it was just terrible and reps that had barely any knowledge. Your best bet is to call and immediately ask the represenative for their Rep ID. The first two digits is which call center they're in. "01" is Albuquerque, I believe. Call center 11, 13, (in Canada) and 4 are generally pretty good too. But overall, it seems that Albuquerque has the highest budget, and they generally get anything done that I ask for in a single-call basis. If you call, and their call center is three-digits long, they're outsourced and you should immediately hang up the phone, and just wait 5-10 minutes to call back later. Offshore call centers exist as window dressing; and can't do much at all. I also noticed that sometimes, these jerks at the offshore call center will call you back. Just tell them you "are on the other line with a *very* important client" and "you'll make a bill payment later" even if your actually calling for something else. Customer service is very intangible. It's best to get ahold of someone who can fix the issue. These tips will increase your likliness of getting stuff done. Though I love T-Mobile, this isn't much of an achievement considering how useless Verizon (especially) and the rest are. Been with T-Mobile now for 2 years, have no solid complaints. T-Mobile and Sprint were the worst phone service company in the USA. I rank AT&T first and then Verizon. Sprint and T-Mobile are cheaper but coverage is terrible. T-Mobile is a great company. They have been getting better all around over the years. I tried their network in Boston and it and jumped leaps and bounds over the years. The only 2 problems I still see in my area are suburb coverage and long customer care hold times.